© Brown and Ferrick; Licensee Bentham Open. Transphyseal femoral neck fractures are an extremely rare event, mainly occurring in children subjected to an significant traumatic force. The diagnosis is usually suggested by clinical examination with radiographic confirmation. Management varies; however, no consensus exists as to proper treatment. Intervention is primarily focused on the prevention of avascular necrosis (AVN) of the femoral epiphysis. We present the case of a 20-month-old male with a delayed diagnosis of transphyseal femoral neck fracture. X-ray (XR) and computed tomography (CT) scan images were used for diagnosis, to track healing, and monitor the possible emergence of avascular necrosis. Final imaging demonstrated full healing without AVN at two years. This study demonstrates the successful treatment of a rare pediatric fracture type with possible life-changing complications. Reduction, surgical fixation with K-wires, and spica casting are demonstrated as being acceptable treatment in the very young transphyseal fracture patient. Keywords: Transphyseal femoral neck fracture, avascular necrosis. The incidence of avascular necrosis in children suffering from transphyseal femoral neck fractures has been reported to be up to 90%. The incidence of femoral neck fractures is much lower in children than in adults and usually due to high-energy trauma . Of these fractures, Delbet type I, or transphyseal femoral neck fractures, are the least common, occurring in roughly 8% of femoral neck fractures in a metanalysis . The incidence is rare enough that the relevant literature citations involve no more than eleven patients in any single study . The most common complication when dealing with Delbet Type I fractures is the high incidence of avascular necrosis of the femoral epiphysis. This occurs more often in the fractures associated with dislocation, however any patient is at a higher risk simply due to the transphyseal nature of the fracture [1, 3, 4]. The available literature is scant, so much so that a PUBMED search for “transphyseal femoral neck fracture” reveals exactly twenty papers, of which almost all of the relevant papers are case studies. The patient is a 20-month-old male child who presented to the emergency room after falling from a second-story window. The child stood up after the fall and was ambulating at the scene with a limp of his right lower extremity. A multidisciplinary group evaluated the patient and he was admitted overnight after initial evaluation, which revealed no fractures or dislocations in his cervical spine or bilateral lower extremities (Fig. 1). Orthopaedically, he was diagnosed with a right leg contusion and instructed to follow up in one week. Initial XR and CT of twenty-month-old male child demonstrating no fracture or dislocation of right hip. Arrow delineates the physis. The patient returned to the Emergency Room seven days later with an antalgic gait, toe walking, and protected weight bearing on the right lower extremity. Mother stated he had been refusing to bear weight fully and had regressed to cruising on the furniture. 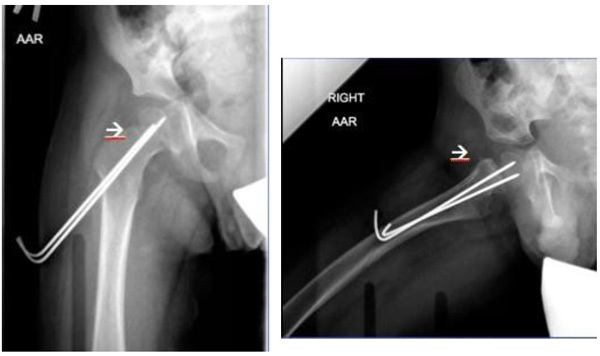 Orthopaedics was consulted and the patient’s pelvic radiographs demonstrated a displaced transphyseal fracture (Fig. 2). Displaced trans-physeal fracture in twenty-month-old male child. In the operating room, the fracture was reduced with gentle internal rotation and flexion at the hip, and two 0.062mm K-wires were placed from the lateral proximal femoral cortex up the femoral neck, across the physis, and into the epiphysis. Alignment was verified fluoroscopically (Fig. 3). In the operating room a one-and-a-half leg spica cast was placed. Patient was monitored overnight and discharged the next day. Operative reduction and pinning of fracture in twenty-month-old male child. The patient was maintained comfortably in the spica cast for 6 total weeks, with two clinical visits to ensure cast condition and comfort. At six weeks, the patient’s pins were removed and his parents were instructed to keep him non- weight-bearing as long as possible. By the next visit at ten weeks after surgery, the patient was fully weight bearing and had resumed all activities. He continued to be followed for another two years, with full radiographic healing, no osteonecrosis, a normal-appearing physis, and normal function noted (Fig. 4). Two year follow-up after pin removal and return to weight bearing in four year old male child. Transphyseal fractures of the femoral neck in children are rare, occurring least often in the Delbet classification . This rare fracture pattern tends to occur most often in young children after high-energy trauma . Although rare, they have the highest risk of avascular necrosis of the Delbet fracture types. A meta-analysis demonstrated that a type I fracture is 14 times more likely than type IV fractures to develop AVN . They can also occur in conjunction with a hip dislocation, which usually portends a much worse prognosis . In general, Delbet Type I fractures without dislocations in young children have a better prognosis than those with dislocations . The most common complication seen in this fracture population is avascular necrosis of the femoral head. In the early literature, the risk of AVN in a Delbet Type I fracture was as high as 100% . In current literature, the risk is in the range of 38% . Damage to the retinacular vessels may compromise blood flow to the femoral head resulting in the distinct patterns of AVN seen in children . Ratliff defined AVN of the pediatric femoral head as: type I (diffuse necrosis of the femoral head and neck distal to the fracture), type II (necrosis confined to the epiphysis), and type III (necrosis of the femoral neck with sparing of the epiphysis) . The Ratliff types seen in transphyseal fractures are Ratliff I and II, secondary to the retinacular vessel damage . The decreased risk of AVN seen in the more recent literature may be attributable to the differences in fracture care. In the past, the standard treatment of a femoral neck fracture in a child was closed reduction with spica casting, whereas, current treatment consists of closed or open reduction and fixation using percutaneous pins or screws . Gentle closed reduction and fixation with smooth pins in younger patients is indicated for type-I fractures without dislocation . It has been suggested that, in children younger than two years old, closed reduction and application of a spica cast without internal fixation may be adequate with a fluoroscopically demonstrated stable reduction [9, 10]. Younger children with the fracture type seen in our patient typically do better than those patients of an older age. A meta-analysis of femoral neck fractures calculated that older children were 14 times more likely to develop AVN for every year of increasing age . Forlin and Miller demonstrated improved outcomes in type-I fractures in children younger than two and a half years old [8, 12]. It has been suggested that these results may be due to the increased ability of very young children to revascularize and remodel the femoral head . The excellent outcome of our patient occurred despite a delay in accurate diagnosis for seven days. This experience is consistent with previous reports in the literature, most recently with a study evaluating delayed (>24 hours) treatment for femoral neck fractures demonstrating a 14.3% AVN rate. The AVN rate was significantly affected by the amount of delay (>10 days) and the use of open reduction . These results are similar to another study done in India, which demonstrated a 19.4% AVN rate in patients treated in less than 24 hours after injury . Despite the severity of his fracture and the delay in treatment, our patient did well, with his young age benefiting his outcome. The use of a closed reduction in this case possibly worked to our advantage, with initial healing minimally disturbed by the closed reduction and K-wire fixation. The lack of AVN greater than two years after his fracture portends a normal future, although the risk for leg length discrepancy may remain. The care provided here in addition to the patient’s young age may have allowed for the excellent outcome, however, he might have simply been in the 60% or more of patients who do well. Hughes LO, Beaty JH. Current concepts review: fractures of the head and neck of the femur in children. J Bone Joint Surg Am 1994; 76(2): 283-92. Ogden JA. Hip development and vascularity: Relationship to chondro-osseous trauma in the growing child. In: St. Louis CV, Ed. the HIP: Proceedings of the ninth open scientific meeting of the hip society. Mosby 1981; pp. 139-87. Canale ST, Bourland WL. Fracture of the neck and intertrochan- teric region of the femur in children. J Bone Joint Surg Am 1977; 59(4): 431-43. Canale ST, Beaty JH. Pelvic and hip fractures. In: Rockwood CA, Jr, Wilkins KE, Beaty JH, Eds. Fractures in children. 4th ed. Philadelphia: Lippincott-Raven 1996; pp. 1109-3. Moon ES, Mehlman CT. Risk factors for avascular necrosis after femoral neck fractures in children: 25 Cincinnati cases and meta-analysis of 360 cases. J Orthop Trauma 2006; 20(5): 323-9. Heiser JM, Oppenheim WL. 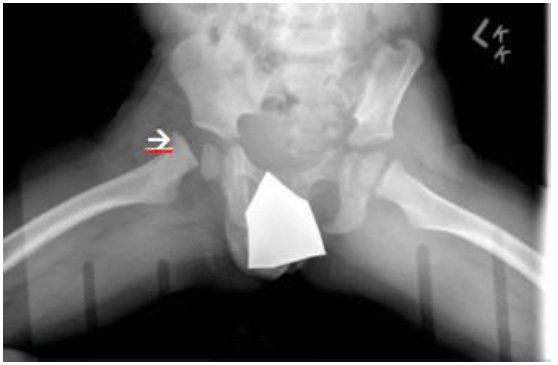 Fractures of the hip in children: a review of forty cases. Clin Orthop Relat Res 1980; (149): 177-84. Onstenk R, van Eeckhoudt SJ, Bos CF, Reinders ME, Aronson DC. 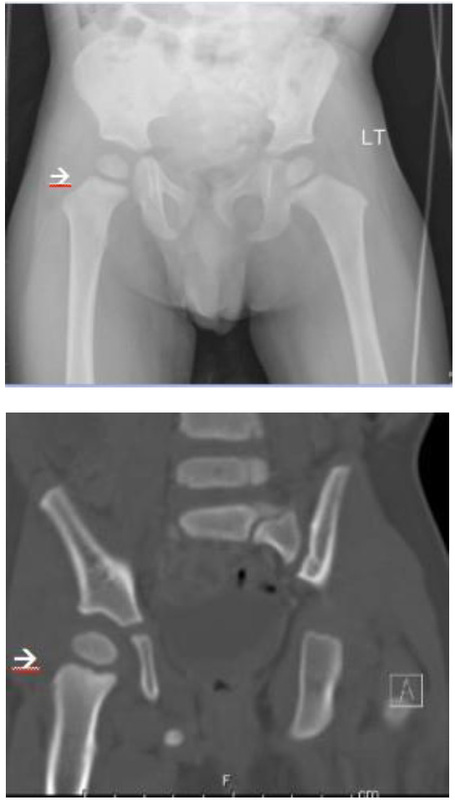 Avascular necrosis of the head in paediatric hip fractures, an inevitable complication. Eur J Orthop Surg Traumatol 2002; 12(2): 75-80. Forlin E, Guille JT, Kumar SJ, Rhee KJ. Transepiphyseal fractures of the neck of the femur in very young children. J Pediatr Orthop 1992; 12(2): 164-8. Cannon SR, Pool CJ. Traumatic separation of the proximal femoral epiphysis and fracture of the mid-shaft of the ipsilateral femur in a child. A case report and review of the literature. Injury 1983; 15(3): 156-8. Miller WE. Fractures of the hip in children from birth to adolescence. Clin Orthop Relat Res 1973; (92): 155-88. Bagatur AE, Zorer G. Complications associated with surgically treated hip fractures in children. J Pediatr Orthop B 2002; 11(3): 219-28. Forlin E, Guille JT, Kumar SJ, Rhee KJ. Complications associated with fracture of the neck of the femur in children. J Pediatr Orthop 1992; 12(4): 503-9. Varshney MK, Kumar A, Khan SA, Rastogi S. Functional and radiological outcome after delayed fixation of femoral neck fractures in pediatric patients. J Orthop Traumatol 2009; 10(4): 211-6. Bali K, Sudesh P, Patel S, Kumar V, Saini U, Dhillon MS. Pediatric femoral neck fractures: our 10 years of experience. Clin Orthop Surg 2011; 3(4): 302-8.